In linguistics, a copula (plural: copulas or copulae; abbreviated cop) is a term for a word that links the subject of a sentence to a subject complement, such as the word is in the sentence "The sky is blue." The word copula derives from the Latin noun for a "link" or "tie" that connects two different things. A copula is often a verb or a verb-like word, though this is not universally the case. A verb that is a copula is sometimes called a copulative or copular verb. In English primary education grammar courses, a copula is often called a linking verb. In other languages, copulas show more resemblances to pronouns, as in Classical Chinese and Guarani, or may take the form of suffixes attached to a noun, as in Korean, Beja, and Inuit languages. Most languages have one main copula, although some (like Spanish, Portuguese and Thai) have more than one, and some have none. In the case of English, this is the verb to be. While the term copula is generally used to refer to such principal forms, it may also be used to refer to some other verbs with similar functions, like become, get, feel and seem in English (these may also be called "semi-copulas" or "pseudo-copulas"). In that sentence, the noun phrase the book is the subject, the verb is serves as the copula, and the prepositional phrase on the table is the predicative expression. The whole expression is on the table may (in some theories of grammar) be called a predicate or a verb phrase. Mary and John are my friends. I am taller than most people. In many questions and other clauses with subject–auxiliary inversion, the copula moves in front of the subject: Are you happy? In inverse copular constructions (see below) the predicative expression precedes the copula, but the subject follows it: In the room were three men. In null-subject (pro-drop) languages, the subject may be omitted, as it may from other types of sentence. In Italian, sono stanco means "I am tired", literally "am tired". In non-finite clauses in languages like English, the subject is often absent, as in the participial phrase being tired or the infinitive phrase to be tired. The same applies to most imperative sentences like Be good! For cases in which no copula appears, see § Zero copula below. Any of the three components may be omitted as a result of various general types of ellipsis. In particular, in English, the predicative expression may be elided in a construction similar to verb phrase ellipsis, as in short sentences like I am; Are they? (where the predicative expression is understood from the previous context). Inverse copular constructions, in which the positions of the predicative expression and the subject are reversed, are found in various languages. They have been the subject of much theoretical analysis, particularly in regard to the difficulty of maintaining, in the case of such sentences, the usual division into a subject noun phrase and a predicate verb phrase. Another issue is verb agreement when both subject and predicative expression are noun phrases (and differ in number or person): in English, the copula normally agrees with the preceding phrase even if it is not logically the subject, as in the cause of the riot is (not are) these pictures of the wall. Compare Italian la causa della rivolta sono ("are", not è "is") queste foto del muro. The boy became a man. The girl got excited by her new toy. The dog grew tired from the activity. I want only to be myself. The Morning Star is the Evening Star. The hen is next to the cockerel. Other special uses of copular verbs are described in some of the following sections. Some languages use different copulas, or different syntax, when denoting a permanent, essential characteristic of something and when denoting a temporary state. For examples, see the sections on the Romance languages, Slavic languages and Irish. In many languages the principal copula is a verb, like English (to) be, German sein, Mixtec kuu, Touareg emous, etc. It may inflect for grammatical categories like tense, aspect and mood, like other verbs in the language. Being a very commonly used verb, it is likely that the copula has irregular inflected forms; in English, the verb be has a number of highly irregular (suppletive) forms and has more different inflected forms than any other English verb (am, is, are, was, were, etc. ; see English verbs for details). Other copulas show more resemblances to pronouns. That is the case for Classical Chinese and Guarani, for instance. In highly synthetic languages, copulas are often suffixes, attached to a noun, but they may still behave otherwise like ordinary verbs: -u- in Inuit languages. In some other languages, like Beja and Ket, the copula takes the form of suffixes that attach to a noun but are distinct from the person agreement markers used on predicative verbs. This phenomenon is known as nonverbal person agreement (or nonverbal subject agreement), and the relevant markers are always established as deriving from cliticized independent pronouns. For cases in which the copula is omitted or takes zero form, see § Zero copula below. A copular verb may also have other uses supplementary to or distinct from its uses as a copula. Je suis arrivé. French for "I have arrived," literally "I am arrived." The last usage was formerly prevalent in English also. The auxiliary functions of these verbs derive from their copular function, and can be interpreted as a special case of the copular function (the verbal form that follows it being considered adjectival). The English to be, and its equivalents in certain other languages, also have a non-copular use as an existential verb, meaning "to exist." This use is illustrated in the following sentences: I want only to be, and that is enough; I think therefore I am; To be or not to be, that is the question. In these cases, the verb itself expresses a predicate (that of existence), rather than linking to a predicative expression as it does when used as a copula. In ontology it is sometimes suggested that the "is" of existence is reducible to the "is" of property attribution or class membership; to be, Aristotle held, is to be something. However, Abelard in his Dialectica made a reductio ad absurdum argument against the idea that the copula can express existence. Similar examples can be found in many other languages; for example, the French and Latin equivalents of I think therefore I am are Je pense, donc je suis and Cogito ergo sum, where suis and sum are the equivalents of English "am," normally used as copulas. However, other languages prefer a different verb for existential use, as in the Spanish version Pienso, luego existo (where the verb existir "to exist" is used rather than the copula ser or estar "to be"). Another type of existential usage is in clauses of the there is... or there are... type. Languages differ in the way they express such meanings; some of them use the copular verb, possibly with an expletive pronoun like the English there, while other languages use different verbs and constructions, like the French il y a (which uses parts of the verb avoir "to have," not the copula être) or the Swedish finns (the passive voice of the verb for "to find"). For details, see existential clause. Relying on a unified theory of copular sentences, it has been proposed that the English there-sentences are subtypes of inverse copular constructions. In some languages, copula omission occurs within a particular grammatical context. For example, speakers of Russian, Indonesian, Turkish, Hungarian, Arabic, Hebrew, and Quechuan languages consistently drop the copula in present tense: Russian: я человек, ya chelovek "I (am a) person;" Indonesian: saya seorang manusia "I (am) a human;" Turkish: o insan "s/he (is a) human;" Hungarian: ő ember "s/he (is) a human;" Arabic: أنا إنسان, ʔanā ʔinsān "I (am a) human;" Hebrew: אני אדם, ʔani ʔadam "I (am a) human;" Southern Quechua: payqa runam "s/he (is) a human." The usage is known generically as the zero copula. Note that in other tenses (sometimes in forms other than third person singular), the copula usually reappears. Such poetic copula dropping is more pronounced in some languages other than English, like the Romance languages. In informal speech of English, the copula may also be dropped in general sentences, as in "She a nurse." It is a feature of African-American Vernacular English, but is also used by a variety of other English speakers in informal contexts. An example is the sentence "I saw twelve men, each a soldier." In Ancient Greek, when an adjective precedes a noun with an article, the copula is understood: ὁ οἴκος ἐστὶ μακρός, "the house is large," can be written μακρός ὁ οἴκος, "large the house (is)." In Māori, the zero copula can be used in predicative expressions and with continuous verbs (many of which take a copulative verb in many Indo-European languages) — He nui te whare, literally "a big the house," "the house (is) big;" I te tēpu te pukapuka, literally "at (past locative particle) the table the book," "the book (was) on the table;" Nō Ingarangi ia, literally "from England (s)he," "(s)he (is) from England," Kei te kai au, literally "at the (act of) eating I," "I (am) eating." Alternatively, in many cases, the particle ko can be used as a copulative (though not all instances of ko are used as thus, like all other Maori particles, ko has multiple purposes): Ko nui te whare "The house is big;" Ko te pukapuka kei te tēpu "It is the book (that is) on the table;" Ko au kei te kai "It is me eating." However, when expressing identity or class membership, ko must be used: Ko tēnei tāku pukapuka "This is my book;" Ko Ōtautahi he tāone i Te Waipounamu "Christchurch is a city in the South Island (of New Zealand);" Ko koe tōku hoa "You are my friend." In Hungarian, zero copula is restricted to present tense in third person singular and plural: Ő ember/Ők emberek — "s/he is a human"/"they are humans;" but: (én) ember vagyok "I am a human," (te) ember vagy "you are a human," mi emberek vagyunk "we are humans," (ti) emberek vagytok "you (all) are humans." The copula also reappears for stating locations: az emberek a házban vannak, "the people are in the house," and for stating time: hat óra van, "it is six o'clock." However, the copula may be omitted in colloquial language: hat óra (van), "it is six o'clock." Hungarian uses copula lenni for expressing location: Itt van Róbert "Bob is here," but it is omitted in the third person present tense for attribution or identity statements: Róbert öreg "Bob is old;" ők éhesek "They are hungry;" Kati nyelvtudós "Cathy is a linguist" (but Róbert öreg volt "Bob was old," éhesek voltak "They were hungry," Kati nyelvtudós volt "Cathy was a linguist). In Turkish, both the third person singular and the third person plural copulas are omittable. Ali burada and Ali buradadır both mean "Ali is here," and Onlar aç and Onlar açlar both mean "They are hungry." Both of the sentences are acceptable and grammatically correct, but sentences with the copula are more formal. The Turkish first person singular copula suffix is omitted when introducing oneself. Bora ben (I am Bora) is grammatically correct, but "Bora benim" (same sentence with the copula) is not for an introduction (but is grammatically correct in other cases). Further restrictions may apply before omission is permitted. For example, in the Irish language, is, the present tense of the copula, may be omitted when the predicate is a noun. Ba, the past/conditional, cannot be deleted. If the present copula is omitted, the pronoun (e.g., é, í, iad) preceding the noun is omitted as well. I feel bad that she can't come with us. London stands (is) on the river Thames. How is Mary? ; She seems (is) well (fine). Some verbs have rarer, secondary uses as copular verbs, like the verb fall in sentences like The zebra fell victim to the lion. These extra copulas are sometimes called "semi-copulas" or "pseudo-copulas." For a list of common verbs of this type in English, see List of English copulae. In Indo-European languages, the words meaning to be are sometimes similar to each other. Due to the high frequency of their use, their inflection retains a considerable degree of similarity in some cases. Thus, for example, the English form is is a cognate of German ist, Latin est, Persian ast and Russian jest', even though the Germanic, Italic, Iranian and Slavic language groups split at least 3000 years ago. The origins of the copulas of most Indo-European languages can be traced back to four Proto-Indo-European stems: *es- (*h1es-), *sta- (*steh2-), *wes- and *bhu- (*bʰuH-). "Is" redirects here. For other uses, see IS. "To be" redirects here. For other uses, see To Be. The English copular verb be has eight forms (more than any other English verb): be, am, is, are, being, was, were, been. Additional archaic forms include art, wast, wert, and occasionally beest (as a subjunctive). For more details see English verbs. For the etymology of the various forms, see Indo-European copula. The main uses of the copula in English are described in the above sections. The possibility of copula omission is mentioned under § Zero copula. A particular construction found in English (particularly in speech) is the use of two successive copulas when only one appears necessary, as in My point is, is that.... The acceptability of this construction is a disputed matter in English prescriptive grammar. The simple English copula "be" may on occasion be substituted by other verbs with near identical meanings. In Persian the verb to be can either take the form of ast in the form of English is or budan in the form of to be. Copulas in the Romance languages usually consist of two different verbs that can be translated as "to be," the main one from the Latin esse (via Vulgar Latin essere; esse deriving from *es-), often referenced as sum, another of the Latin verb's principal parts, and a secondary one from stare (from *sta-), often referenced as sto, another of that Latin verb's principal parts. The resulting distinction in the modern forms is found in all the Iberian Romance languages, and to a lesser extent Italian, but not in French or Romanian. The difference is that the first usually refers to essential characteristics, while the second refers to states and situations, e.g., "Bob is old" versus "Bob is well." A similar division is found in the non-Romance Basque language (viz. egon and izan). (Note that the English words just used, "essential" and "state," are also cognate with the Latin infinitives esse and stare. The word "stay" also comes from Latin stare, through Middle French estai, stem of Old French ester.) In Spanish and Portuguese, the high degree of verbal inflection, plus the existence of two copulas (ser and estar), means that there are 105 (Spanish) and 110 (Portuguese) separate forms to express the copula, compared to eight in English and one in Chinese. Bob è vecchio. Bob es viejo. (O) Bob é velho. "Bob is old." Bob sta bene. Bob está bien. Bob está bem "Bob is well." O Bob é esquisito. Bob es extraño. "Bob is weird." O Bob é idiota. Bob es idiota. "Bob is foolish." O Bob está esquisito. Bob está extraño. "Bob is looking/being strange." O Bob está idiota. Bob está idiota. "Bob is acting/being silly." Some Slavic languages make a distinction between essence and state (similar to that discussed in the above section on the Romance languages), by putting a predicative expression denoting a state into the instrumental case, and essential characteristics are in the nominative. This can apply with other copula verbs as well: the verbs for "become" are normally used with the instrumental case. As noted above under § Zero copula, Russian and other East Slavic languages generally omit the copula in the present tense. In Irish and Scottish Gaelic, there are two copulas, and the syntax is also changed when one is distinguishing between states or situations and essential characteristics. Describing the subject's state or situation typically uses the normal VSO ordering with the verb bí. The copula is is used to state essential characteristics or equivalences. The word is is the copula (rhymes with the English word "miss"). The pronoun used with the copula is different from the normal pronoun. For a masculine singular noun, é is used (for "he" or "it"), as opposed to the normal pronoun sé; for a feminine singular noun, í is used (for "she" or "it"), as opposed to normal pronoun sí; for plural nouns, iad is used (for "they" or "those"), as opposed to the normal pronoun siad. To describe being in a state, condition, place, or act, the verb "to be" is used: Tá mé ag rith. "I am running." iyé ndi mphunzitsi "he is a teacher"
iyé sí mphunzitsi "he is not a teacher"
ine ndine mphunzitsi "I am a teacher"
iwe ndiwe mphunzitsi "you (sg.) are a teacher"
ine síndine mphunzitsi "I am not a teacher"
iyé ali bwino "he is well"
iyé sáli bwino "he is not well"
iyé ali ku nyumbá "he is in the house"
ine ndili bwino "I am well"
iwe uli bwino "you (sg.) are well"
kunyumbá kuli bwino "at home (everything) is fine"
iyé analí bwino "he was well (this morning)"
iyé ánaalí mphunzitsi "he was a teacher (at that time)"
máwa ákhala bwino "he'll be fine tomorrow"
Uniquely, the existence of the copulative verbalizer suffix in the Southern Peruvian Aymaran language variety, Muylaq' Aymara, is evident only in the surfacing of a vowel that would otherwise have been deleted because of the presence of a following suffix, lexically prespecified to suppress it. As the copulative verbalizer has no independent phonetic structure, it is represented by the Greek letter ʋ in the examples used in this entry. Accordingly, unlike in most other Aymaran variants, whose copulative verbalizer is expressed with a vowel-lengthening component, -:, the presence of the copulative verbalizer in Muylaq' Aymara is often not apparent on the surface at all and is analyzed as existing only meta-linguistically. However, it is also relevant to note that in a verb phrase like "It is old," the noun thantha meaning "old" does not require the copulative verbalizer, thantha-wa "It is old." It is now pertinent to make some observations about the distribution of the copulative verbalizer. The best place to start is with words in which its presence or absence is obvious. When the vowel-suppressing first person simple tense suffix attaches to a verb, the vowel of the immediately preceding suffix is suppressed (in the examples in this subsection, the subscript "c" appears prior to vowel-suppressing suffixes in the interlinear gloss to better distinguish instances of deletion that arise from the presence of a lexically pre-specified suffix from those that arise from other (e.g. phonotactic) motivations). Consider the verb sara- which is inflected for the first person simple tense and so, predictably, loses its final root vowel: sar(a)-ct-wa "I go." However, prior to the suffixation of the first person simple suffix -ct to the same root nominalized with the agentive nominalizer -iri, the word must be verbalized. The fact that the final vowel of -iri below is not suppressed indicates the presence of an intervening segment, the copulative verbalizer: sar(a)-iri-ʋ-t-wa "I usually go." It is worthwhile to compare of the copulative verbalizer in Muylaq' Aymara as compared to La Paz Aymara, a variant which represents this suffix with vowel lengthening. Consider the near-identical sentences below, both translations of "I have a small house" in which the nominal root uta-ni "house-attributive" is verbalized with the copulative verbalizer, but note that the correspondence between the copulative verbalizer in these two variants is not always a strict one-to-one relation. Masc'avlebeli var. "I am a teacher." Masc'avlebeli viknebi. "I will be a teacher." Masc'avlebeli viqavi. "I was a teacher." Masc'avlebeli vqopilvar. "I have been a teacher." Masc'avlebeli vqopiliqavi. "I had been a teacher." Ich bin Lehrer gewesen. "I have been a teacher," literally "I am teacher been." Ich war Lehrer gewesen. "I had been a teacher," literally "I was teacher been." Here, gewesen is the past participle of sein ("to be") in German. In both examples, as in Georgian, this participle is used together with the present and the past forms of the verb in order to conjugate for the perfect and the pluperfect aspects. Haitian Creole, a French-based creole language, has three forms of the copula: se, ye, and the zero copula, no word at all (the position of which will be indicated with Ø, just for purposes of illustration). Although no textual record exists of Haitian-Creole at its earliest stages of development from French, se is derived from French [se] (written c'est), which is the normal French contraction of [sə] (that, written ce) and the copula [e] (is, written est) (a form of the verb être). The derivation of ye is less obvious; but we can assume that the French source was [ile] ("he/it is," written il est), which, in rapidly spoken French, is very commonly pronounced as [je] (typically written y est). The use of a zero copula is unknown in French, and it is thought to be an innovation from the early days when Haitian-Creole was first developing as a Romance-based pidgin. Latin also sometimes used a zero copula. Chal se ekriven. "Charles is writer." Chal, ki se ekriven, pa vini. "Charles, who is writer, not come." Se mwen! "It's me!" French C'est moi! Se pa fasil. "It's not easy," colloquial French C'est pas facile. Kijan ou ye? "How you are?" The above is, however, only a simplified analysis. Japanese has copulae that are most often translated as the "to be" verb of English. The Japanese copula has many forms. The words da and desu are used to predicate sentences, while na and de are particles used within sentences to modify or connect. The difference between da and desu appears simple. For instance, desu is more formal and polite than da. Thus, many sentences like the ones below are almost identical in meaning and differ in the speaker's politeness to the addressee and in nuance of how assured the person is of their statement. However, desu may never come before the end of a sentence, and da is used exclusively to delineate subordinate clauses. Japanese sentences may be predicated with copulas or with verbs. However, desu may not always be a predicate. In some cases, its only function is to make a sentence predicated with a stative verb more polite. However, da always functions as a predicate, so it cannot be combined with a stative verb, because sentences need only one predicate. See the examples below. *このビールはおいしいだ。 *Kono bīru wa oishii da. This is unacceptable because da may only serve as a predicate. There are several theories as to the origin of desu; one is that it is a shortened form of であります de arimasu, which is a polite form of である de aru. In general, both forms are used in only writing and more formal situations. Another form, でございます de gozaimasu, which is the more formal version of de arimasu, in the etymological sense a conjugation of でござる de gozaru and an honorific suffix -ます -masu, is also used in some situations and is very polite. Note that de aru and de gozaru are considered to be compounds of a particle で de, and existential verbs aru and gozaru. です desu may be pronounced っす ssu in colloquial speech. 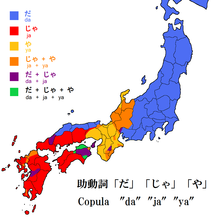 The copula is subject to dialectal variation throughout Japan, resulting in forms like や ya in Kansai and じゃ ja in Hiroshima (see map above). Japanese also has two verbs corresponding to English "to be": aru and iru. They are not copulas but existential verbs. Aru is used for inanimate objects, including plants, whereas iru is used for animate things like people, animals, and robots, though there are exceptions to this generalization. 本はテーブルにある。 Hon wa tēburu ni aru. "The book is on a table." 小林さんはここにいる。 Kobayashi-san wa koko ni iru. "Kobayashi is here." Japanese speakers, when learning English, often drop the auxiliary verbs "be" and "do," incorrectly believing that "be" is a semantically empty copula equivalent to "desu" and "da." For sentences with predicate nominatives, the copula "이" (i-) is added to the predicate nominative (with no space in between). 바나나는 과일이다. Ba-na-na-neun gwa-il-i-da. "Bananas are a fruit." Some adjectives (usually colour adjectives) are nominalized and used with the copula "이"(i-). 장미는 빨개요. Jang-mi-neun ppal-gae-yo. "Roses are red." 장미는 빨간색이다. Jang-mi-neun ppal-gan-saek-i-da. "Roses are red-coloured." Some Korean adjectives are derived using the copula. Separating these articles and nominalizing the former part will often result in a sentence with a related, but different meaning. Using the separated sentence in a situation where the un-separated sentence is appropriate is usually acceptable as the listener can decide what the speaker is trying to say using the context. N.B. The characters used are simplified ones, and the transcriptions given in italics reflect Standard Chinese pronunciation, using the pinyin system. In Chinese, both states and qualities are, in general, expressed with stative verbs (SV) with no need for a copula, e.g., in Chinese, "to be tired" (累 lèi), "to be hungry" (饿 è), "to be located at" (在 zài), "to be stupid" (笨 bèn) and so forth. A sentence can consist simply of a pronoun and such a verb: for example, 我饿 wǒ è ("I am hungry"). Usually, however, verbs expressing qualities are qualified by an adverb (meaning "very," "not," "quite," etc. ); when not otherwise qualified, they are often preceded by 很 hěn, which in other contexts means "very," but in this use often has no particular meaning. Before the Han Dynasty, the character 是 served as a demonstrative pronoun meaning "this." (This usage survives in some idioms and proverbs.) Some linguists believe that 是 developed into a copula because it often appeared, as a repetitive subject, after the subject of a sentence (in classical Chinese we can say, for example: "George W. Bush, this president of the United States" meaning "George W. Bush is the president of the United States). The character 是 appears to be formed as a compound of characters with the meanings of "early" and "straight." Question: 你的汽车是不是红色的？ nǐ de qìchē shì bú shì hóngsè de? "Is your car red or not?" Response: 是的 shì de "Is," meaning "Yes," or 不是 bú shì "Not is," meaning "No." Yet another use of 是 is in the shì...(de) construction, which is used to emphasize a particular element of the sentence; see Chinese grammar § Cleft sentences. In Hokkien 是 sī acts as the copula, and 是 /z/ is the equivalent in Wu Chinese. Cantonese uses 係 (Jyutping: hai6) instead of 是; similarly, Hakka uses 係 he55. In Siouan languages like Lakota, in principle almost all words—according to their structure—are verbs. So not only (transitive, intransitive and so-called "stative") verbs but even nouns often behave like verbs and do not need to have copulas. For example, the word wičháša refers to a man, and the verb "to-be-a-man" is expressed as wimáčhaša/winíčhaša/wičháša (I am/you are/he is a man). Yet there also is a copula héčha (to be a ...) that in most cases is used: wičháša hemáčha/heníčha/héčha (I am/you are/he is a man). In order to express the statement "I am a doctor of profession," one has to say pezuta wičháša hemáčha. But, in order to express that that person is THE doctor (say, that had been phoned to help), one must use another copula iyé (to be the one): pežúta wičháša (kiŋ) miyé yeló (medicine-man DEF ART I-am-the-one MALE ASSERT). In order to refer to space (e.g., Robert is in the house), various verbs are used, e.g., yaŋkÁ (lit., to sit) for humans, or háŋ/hé (to stand upright) for inanimate objects of a certain shape. "Robert is in the house" could be translated as Robert thimáhel yaŋké (yeló), whereas "There's one restaurant next to the gas station" translates as Owótethipi wígli-oínažiŋ kiŋ hél isákhib waŋ hé. The constructed language Lojban has multiple sorts of copula. The most common, cu, is used to separate any noun phrases before the predicate from the predicate, and is always optional. The others may be used when the other part of the sentence is another noun phrase, but are sometimes viewed with distaste in the Lojban community, because all words that express a predicate can be used as verbs. The three sentences "Bob runs," "Bob is old," and "Bob is a fireman," for instance, would all have the same form in Lojban: "la .bob. cu bajra", "la .bob. cu tolcitno", and "la .bob. cu fagdirpre". There are several such copulas: me turns whatever follows the word me into a verb that means to be what it follows. For example, me la bob. means "to be Bob." Another copula is du, which is a verb that means all its arguments are the same thing (equal). The E-Prime language, based on English, simply avoids the issue by not having a generic copula. It requires instead a specific form like "remains," "becomes," "lies," or "equals." Esperanto uses the copula much as English. The infinitive is esti, and the whole conjugation is regular (like all other Esperanto verbs). In addition, adjectival roots can be turned into stative verbs: La ĉielo bluas. "The sky is blue." Likewise, Ido has a copula that works as English "to be." Its infinitive is esar, and, as in Esperanto, all of its forms are regular like all other verbs. The simple present is esas for all persons; the simple past is esis, the simple future is esos, and the imperative is esez, among a few more forms. However, Ido also has an alternative irregular form for the simple present (es), which some Idists frown upon. The possibility to turn adjectives and even nouns into verbs also exists, although this is mostly done by means of an affix, on top of the verbal endings. The affix is -es-. So, "The sky is blue." can be said as La cielo bluesas. As can be seen, the suffix -es- plus the verbal desinence -as are simply the verb "to be" annexed to the adjectival or nominal root. Interlingua speakers use copulas with the same freedom as speakers of Slavic, Germanic, and Romance languages. In addition to combinations with esser ("to be"), expressions like cader prede ("to fall prey") are common. Esser is stated, rather than omitted as in Russian. ^ See the appendix to Moro 1997 and the references cited there for a short history of the copula. ^ See Everaert et al. 2006. ^ a b Givón, T. (1993). English Grammar: A function-based introduction. 1. John Benjamins Publishing Company. pp. 103–104. ^ a b "What are copular verbs?". November 15, 2010. ^ Regina Pustet (12 June 2003). Copulas: Universals in the Categorization of the Lexicon. OUP Oxford. p. 47. ISBN 978-0-19-155530-5. ^ a b Stassen, Leon (1997). Intransitive Predication. Oxford studies in typology and linguistic theory. Oxford University Press. p. 39. ISBN 978-0-19-925893-2. ^ See Moro 1997, and "existential sentences and expletive there" in Everaert et al. 2006, for a detailed discussion of this issue and a historical survey of the major proposals. ^ "Language Maori". WALS Online. Retrieved 2014-02-07. ^ Butler, C.S. (2003). Structure and Function: A Guide to the Three Major Structural-Functional Theories. John Benjamins Publishing. pp. 425–6. doi:10.1075/slcs.63. ISBN 9789027296535. ^ Coppock, Elizabeth; Brenier, Jason; Staum, Laura; Michaelis, Laura (February 10, 2006). ""The thing is, is" Is No Mere Disfluency" (PDF). Proceedings of the Thirty-second Annual Meeting of the Berkeley Linguistics Society. 32nd Annual Meeting of the Berkeley Linguistics Society. Berkeley, California: Sheridan Books. pp. 85–96. ^ "Conjugação de verbos regulares e irregulares". Conjuga-me. 2007-09-06. Retrieved 2014-02-07. ^ "Foclóir Gaeilge–Béarla (Ó Dónaill): rith". www.teanglann.ie. ^ Maxson, Nathaniel (2011). Chicheŵa for English Speakers: A New and Simplified Approach. Assemblies of God Literature Press, Malawi, pp. 107, 108, 110. ^ *Stevick, Earl et al. (1965). Chinyanja Basic Course. Foreign Service Institute, Washington, D.C., pp. 157, 160–65. ^ Coler, Matt (2015). A Grammar of Muylaq' Aymara: Aymara as spoken in Southern Peru. Brill's Studies in the Indigenous Languages of the Americas. Brill. pp. 472–476. ISBN 978-9-00-428380-0. ^ Howe 1990. Source for most of the Haitian data in this article; for more details on syntactic conditions as well as Haitian-specific copula constructions, like se kouri m ap kouri (It's run I progressive run; "I'm really running! "), see the grammar sketch in this publication. ^ Valdman & Rosemond 1988. Bram, Barli (5 July 1995). Write Well: Improving Writing Skills. Yogyakarta, Indonesia: Penerbit Kanisius. p. 128. ISBN 978-979-497-378-3. Howe, Catherine; Desmarattes, Jean Lionel (1990). Haitian Creole Newspaper Reader. Dunwoody Press. p. 232. ISBN 978-0-931745-59-1. Kneale, William and Martha (1962). The Development of Logic. Oxford: Clarendon Press. ISBN 0-19-824183-6. OCLC 373178. Smith, Ron F; O'Connell, Loraine M. (March 2003). Editing Today Workbook (2nd ed.). Wiley-Blackwell. p. 264. ISBN 978-0-8138-1317-2. Moro, A. (1997) The Raising of Predicates. Cambridge University Press, Cambridge, England. Tüting, A. W. (December 2003). Essay on Lakota syntax. Valdman, Albert; Rosemond, Renote (1988). Ann Pale Kreyòl: An Introductory Course in Haitian Creole. Illustrations: Philippe, Pierre-Henri (Illustrated ed.). Creole Institute, Indiana University. ISBN 978-0-929236-00-1. David Crystal (2017). The Story of Be: A Verb's-Eye View of the English Language. Oxford University Press. ISBN 978-0198791096.